We began the Clean-The-Basement task this past week. I just finished with writing the book, I could take on another monumental task, couldn’t I? Hopefully, it will not take as long. It began because my son needed some space in his living/sleeping/library home. Besides, the boxes went under the stairs…you know, the basement stairway in old houses with rock basements…well, you may not…suffice to say it’s deep and wide and dusty, and the boxes went in there ten years ago when we moved into this house. I’ve written a memoir with a fair amount of whining because I kept moving and unpacking and packing. I haven’t moved in ten years. Moving often is useful. You don’t store stuff. Another reason I was loath to tackle the under-stairs was that I knew, at the far back against the wall corner, I’d have to open my mother’s box. The last box from the nursing home after she died, just odds and ends, and which I’d packed in February of 2001 and put into the storage cage for my first apartment in Kansas City and moved here, to the house in far back corner under the stairs, in 2005. Not much smelled like her. For that I was glad. Mostly, it was clothes, sheets, a few odds and ends. I put them all in the washing machine, and dried, and carefully folded. Here’s my mom in a snapshot. She was a lady. A very short lady, four feet eleven and three-quarters, as she said. She graduated from high school. 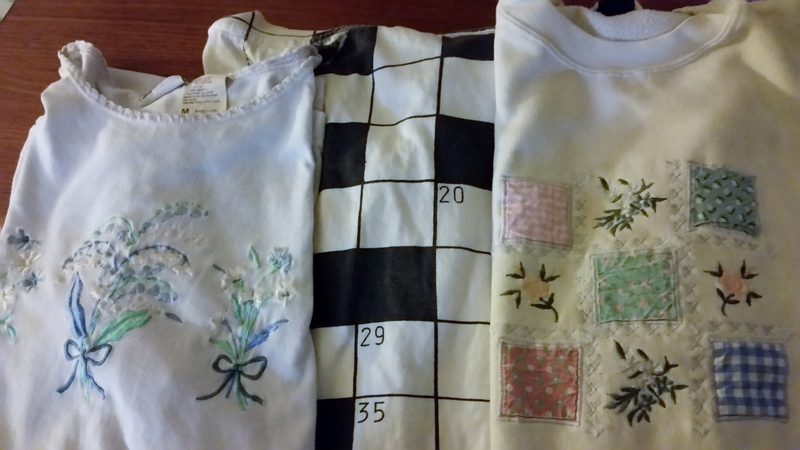 She also embroidered although these two shirts are machine made. 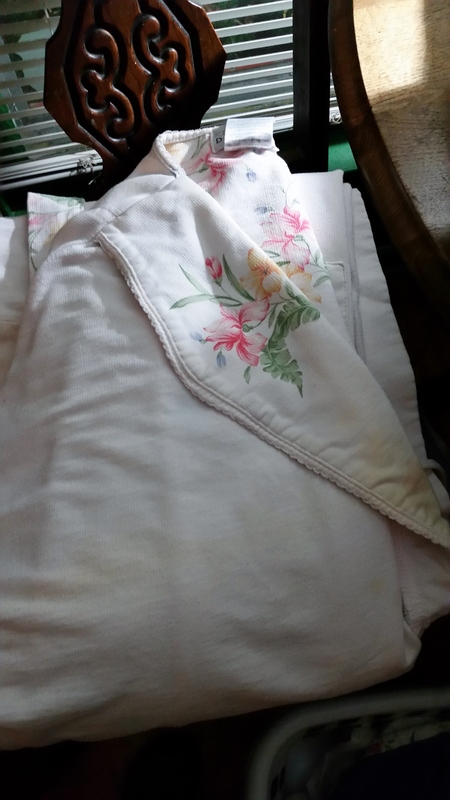 I found one pillowcase, careful and tiny stitches, in another box. Stephen said it may have been his, but he’s not likely to use it. So I got it. What this photos also shows, however, is her crazy. The shirt isn’t only black and white check, it’s a crossword puzzle. Mother was a reader and a writer and she loved crossword puzzles. I do not take after her in that regard. And a farm wife. I’m enough of a farmer. I didn’t need to marry one. All her clothes are soft, soft fabrics, soft comfort. This is her robe. Almost everything I wear is soft. I’d not connected that line before. 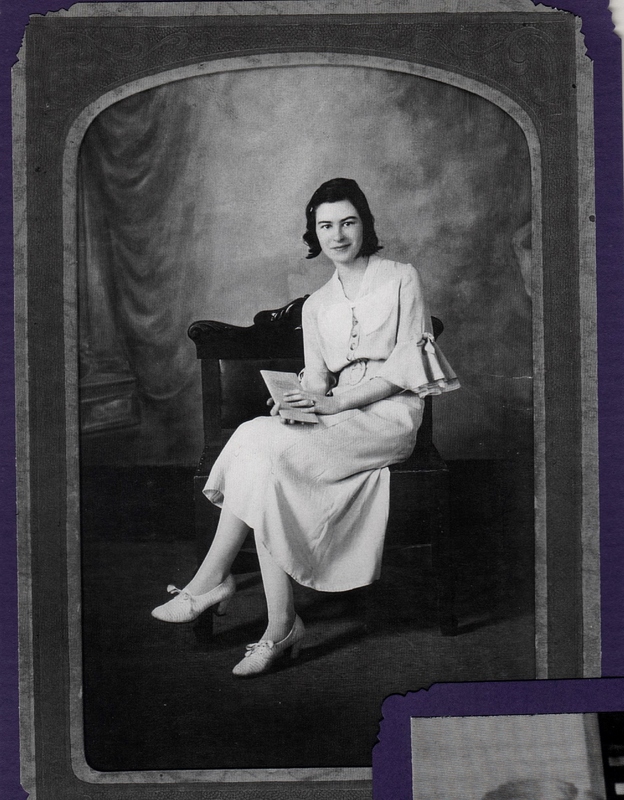 I write often about my mother in the memoir. She liked Hawaii, too, and went there most every winter to my sister’s. There’s a scene in the book where my mother comes to visit me in the jungle retreat center near Hilo and I take her to Hilo Hatties to buy a short muumuu. I found that muumuu too. I’ll keep it. Transformations. I hear many talking/doing/living transformations. It’s a muddled time, there’s no doubt about that. This is the end of our dining room table. It’s November. 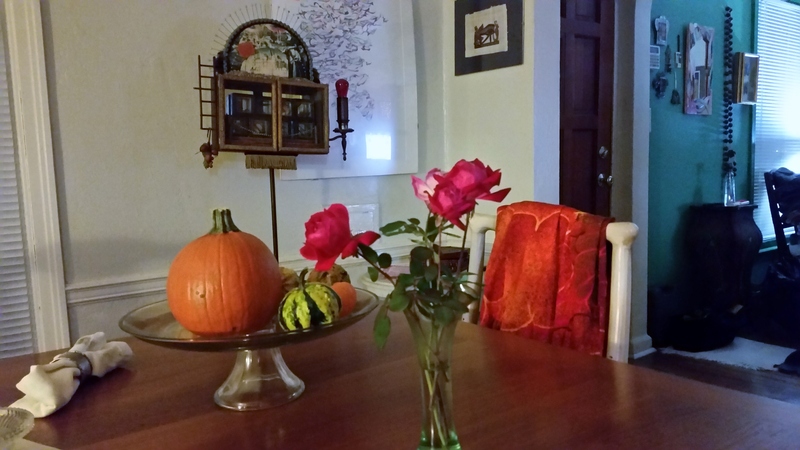 There’s roses, still, from the garden and pumpkin/squash from Trader Joe’s. 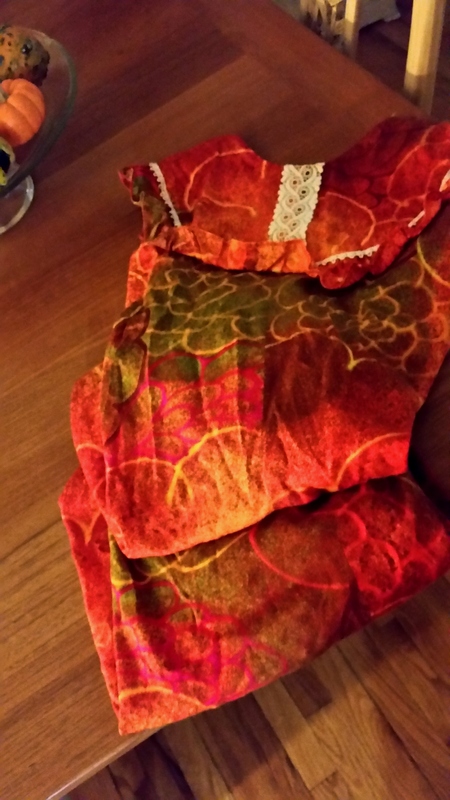 And Mom’s muumuu, hanging on the back of a chair, ready to pack for her next trip. Wonderful title. It brings back memories of Mama who died Christmas Day 1972. After we cleared out the house in preparation of selling it, l I brought a box containing my mother’s wedding dress back home on the plane with me. That box has made all my subsequent moves with me. It is on the shelf of my clothes closet with the Southern Airlines (long defunct) pink baggage claim ticket still attached. I have only sons whose wives were not interested in the wedding dress so the box remains unopened. I could open the any time but haven’t. Somehow it seems fitting to let the memories be instead of replacing them with a remnant of wrinkled yellowed satin. I loved this story. Thank you so much for telling me. Letting the memories be…. yes. I guess that’s what I’m doing now with putting the clean and folded clothes in a box and getting them ready for someone else to enjoy. I expect my mother’s generosity of spirit goes with them. Oh Janet! I can so relate with memories of my Mother. I had crocheted her an afghan years and years ago. It’s pink and rose. I have it. Someday may give it to Saoirse. Right now I am keeping it stored. I see it everytime I open my closed, and think of her. Not much doesn’t remind me of her. She passed in 2003, and everyday, every. single. day. I wish her back with me. Thanks for the road trip down memory lane! Enjoy your posts so much! Thank you so much for commenting, Rebecca! And for reading. Yeah, it’s the mom stuff. I’m so glad you have her afghan. Yes, memory lane. It was difficult and loving at the same time. Mother had lived with various of us, the last being older sister, before she came back home to the nursing home in the hometown where she knew folk, and pieces of her got left in various places. This box was the very last, after the funeral, after everyone came home and had taken whatever they wanted. These were just the end pieces, as it were. The end pieces. Interesting. Thanks for your comment, Terri.